The following is what I wrote last winter for Sally Shields' book, "Naturally Thin - or Discipline? ", in which she profiles 100 thin women. She wanted us to reveal our "secrets", to talk about what we eat, to describe an average day, and tell whether we had ever been overweight. As I have been a healthy-eating vegan for almost 21 years, my weight and physical fitness are “background” for me. That is, at this point, my diet and exercise routine are just that: routine. I don't count calories or pay any attention to the latest fad diet or weigh myself very often. And at my age, I definitely do not “obsess” about my weight; I have been slender all my life, except for a couple of years in high school, 40 years ago. Starting in fourth grade, I went through several years of growing almost 2 inches every six months, so that in sixth grade I was 5'6” and 92 pounds. Our family ate very healthy food (albeit not vegan), and I needed to eat twice as much as my younger siblings because of my growth spurt. By eighth grade, however, I wasn't getting any taller, but unfortunately, I now had the habit of eating a lot, and since I did not cut back how much I ate, I gained weight. I couldn't seem to stop; I was afraid of being stuck in class at school and being “starving”. By tenth grade, I was 5'8” and 142 pounds. The summer following eleventh grade, I was lying by the swimming pool when my mother handed me a bestselling book: “The Doctor's Quick Weight-Loss Diet”, which is essentially The Atkins Diet. As I read the book, I knew I couldn't do the “all-protein” thing, which was all meat, because I knew how lousy I felt whenever I ate meat by itself. But the second half of the book was called “The Doctor's Inches-Off Diet”, which called for everything except meat. I figured out a routine I knew I could do: Cream of Wheat for breakfast, half a cantaloupe with a scoop of vanilla ice milk for lunch, snack on fresh fruit during the afternoon. For dinner, a salad without dressing, and a double helping of whatever vegetables were for dinner. No dessert unless I was dying, and then, fresh fruit. (Thank goodness, it was summer; a fresh peach is 35 calories, I learned.) Every day I felt thinner! By the end of three weeks, I had lost 18 pounds, down to 124. I was elated and loved how I looked in my clothes AND my bikini – and that provided me with all the “will-power” I needed when friends tried to get me to eat something off my diet, because I realized that eating something sugar-y sweet was only yummy for a moment, and not at all worth being heavier than I wanted to be. During the next school year, I dieted to 118, and my girlfriends were amazed. I was no longer avoiding meat, chicken, fish – and so I trained myself intentionally to eat very small portions; I called them “half-portions”. By the time I was 19, I weighed 112. I didn't realize until I had been vegan for about ten years that I had lost weight as a teenager initially by going on a vegan diet (except for the ice milk in the cantaloupe) – because the word “vegan” did not exist in 1971. Now at age 55, when I get up in the morning, I begin by drinking water to re-hydrate myself. For the past year, it's been Kangen water, which is alkaline and highly-oxygenated. I do not eat before I take an 8:30 class almost every morning at my health club: Cardio Dance, Strength, Zumba, salsa, Nia, yoga. I love moving to music, and I'm always open to new and different classes because it's fun to learn new steps, new movements. I used to take Hip-Hop, and soon there will be a Bollywood class. Of course I am aware that staying active and limber and keeping my muscle mass strong has many benefits besides looking great. For the past 10 years, I have had The Ultimate Meal for breakfast. It comes as a powder of 24 organic, freeze-dried, densely-nutritious foods that I make into a smoothie. From time to time, I change what I mix with it; at the moment, it's chocolate almond milk and a banana. I have a double helping (2/3 cup of the powder) so that I get every nutrient necessary for optimum health. Those are not empty words; Sam Gerard, the man who created The Ultimate Meal, is “king of the perfectionists” (as I refer to him) who makes it his mission to have the “ultimate” meal – and he has improved it 17 times since its inception in 1981. Many of us in the Natural Foods industry rely on The Ultimate Meal to supply our bodies with an abundant amount of nutrition. It obviates the need for any additional vitamins or supplements. For optimum health and weight, the name of the game is nutrition: eating highly-nutritious, fresh foods – and leaving out what does not benefit the body. Hence, no animal products, no white flour, no cane sugar, no soda pop, no added salt, no processed foods, nothing fried in oil – ideally, no oil except what is naturally occurring, as in avocados, raw nuts, and whole grains. Yes, I use extra-virgin olive oil, and some Earth Balance. Why is nutrition so important? Because when the body has sufficient stores of nutrients on a daily basis, the body can repair its BILLIONS of cells every night as you sleep. Can you imagine the body trying to repair itself with soda pop, potato chips, fries, processed foods? Those all drag the body down and clog your system with toxins, weakening the immune system, leaving you vulnerable to colds, flu, and worse, set up an acidic condition in the body that is conducive to tumor growth. On the positive side, the better the level of nutrition, the more the aging process is slowed down. Hence, healthy vegans in their '60's with “teenager bodies” abound. After The Ultimate Meal about 10 am, I will be full for 4 or 5 hours, sustained with good, slow-burning energy. Most days I go out to the stable to ride and take care of my horse, and by 2 or 3 pm, when I'm finished, I will be famished. As it's quite a drive home, and no restaurants in that area have healthy food, I take a container of the previous night's leftovers in the car with me to munch on as I drive home. Is food ever more delicious after a lot of physical exercise outdoors? I don't think so. And I have my second container of Kangen water for the day with me. What kind of leftovers from dinner? For almost any dish you can name, there is a healthy, vegan version: whole-grain pizza, whole-grain lasagna and pasta, “beef” tacos, bean or sweet potato burritos, soups, roasted vegetables, garlic mashed potatoes, spanokopita, dolmas, curry, pilaf, barley risotto, stir-frys, teriyaki, spicy soba dishes, burgers on sprouted whole-grain buns – you get the idea. I cook for myself and my elderly parents, with whom I live; Dad's 93 and Mom's 87 – and she still works every day as a real estate broker because she loves it. Half of our dinner plate is fresh green salad: spinach, romaine, carrots, cucumbers, celery, tomatoes, mushrooms, sprouts, and then variables: radishes, red onions, daikon, pomegranate seeds in winter, avocado. I dress the salad in extra-virgin olive oil and sprinkle with kelp (excellent source of nutrients and tastes like the ocean); we have no salt in the house and I do not use salt in food preparation. Another third of the plate is vegetables, often steamed or roasted. Almost every day I include an organic 5-grain combination that I cook in the rice cooker: millet, brown basmati rice, rye berries, whole wheat berries, oat groats; these provide over 200 nutrients and phyto-nutrients that most people never get. I cook these up once or twice a week and store them in the refrigerator, using them as you would rice: “as is” on the plate or added to soups or the salad. The rest of our plate is one of the main dishes I've already mentioned. And I usually make garlic bread, using a (mostly) whole-grain olive bread, spreading it with Earth Balance and fresh, crushed garlic. Believe me, my parents and I NEED the calories! We may have dessert, which is my specialty. (Yes, a thin baker!) 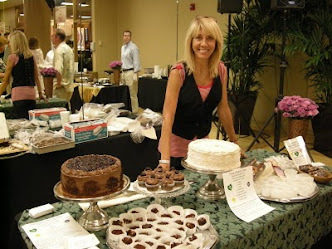 I make organic, whole-grain, wheat-free, no cane sugar, little or no added fat cakes, pies, tarts, uncheesecakes, mousses, cookies. Tonight we will have an organic Granny Smith apple & cherry pie in an organic, whole-grain, low-fat spelt crust – and we grew the apples, so I left the skins on. I don't drink anything with dinner, but later during the evening, I drink my third container of water, giving me 84 oz of water for the day. Occasionally, I make a big cup of ginger tea. I can remember being in my 20's (long before I was vegan), and eating once a day, at 4 pm, and snacking at the end of my waitress job, in a French restaurant in Hollywood, about 1 am. I was modeling swimsuits then, and it was impossible to be too thin. What shifted for me was that after I was vegan, my percentage of body fat lessened (unfortunately, it was not common then to have it measured, and so I didn't) even though I suddenly HAD to eat 3 meals a day, with much more volume of food on my plate. So I say, if you love to eat, go vegan – your taste buds sharpen, fresh foods taste wonderful, and you look and feel great!